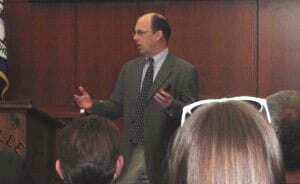 The first New Jersey Bike Summit was held in Denville on Saturday February 27. About 150 attendees, including four from the WWBPA, heard the latest about what’s happening in the world of bicycle (and pedestrian!) advocacy. There was even a cameo appearance by the Bike Lane Fairy! National speakers included Andy Clarke of the League of American Bicyclists, Tim Blumenthal of Bikes Belong, Sharon Roerty of the National Center for Bicycling and Walking and Jeff Miller of the Alliance for Biking and Walking. New Jersey Assemblywoman Grace Spencer, sponsor of the three-foot safe passing bill, which was passed by the Assembly last year but died in the Senate Transportation committee, addressed the group about legislative matters. Sheree Davis, who leads NJ DOT’s Bicycle and Pedestrian program and is a key advocate within NJDOT, followed up with the state of the state from NJDOT’s perspective, including the new Complete Streets policy. Success stories were related by many groups, including our own President Chris Scherer and Laura Torchio of Bike&Walk Montclair, who first showed pictures of the elusive Bike Lane Fairy at an event there. But would she make an appearance? The courtroom in Denville’s Town Hall was sold out, and the agenda was very full, including in-depth presentations about “complete streets” by Mike Dannemiller of the RBA Group and bicycling education by Leigh Ann Von Hagen of Rutgers’ Voorhees Transportation Center. Read more about the day here. Brendan Poh of the New Jersey Bicycle Coalition did a fantastic job organizing and putting on the event. It was a lot of work, and we all thank you and look forward to next year. And the Bike Lane Fairy? We had to wait outside the room until the very end, but she made a brief appearance, posing for her many admirers. Alas, this reporter’s camera batteries were dead. To see her, click here. Philadelphia and South Jersey came up big in the stimulus-money sweepstakes. A $23 million grant will help complete a network of biking and walking trails throughout the region, focused on connections to urban hubs in Philadelphia and Camden. 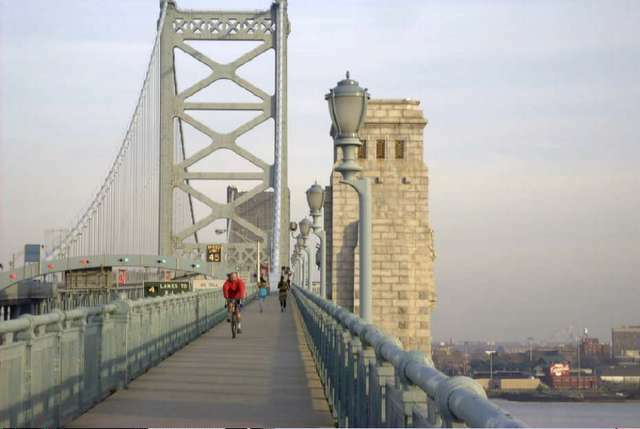 It will fund several missing links on the popular Schuylkill River Trail, links in Camden to the Ben Franklin Bridge and parts of the East Coast Greenway in Pennyslvania. Read more. Just how tough was it to get funded? Only 51 projects (3% of those submitted) were selected. Only two bicycle/pedestrian networks were funded. Unfortunately, $13 million sought for bike paths in Bucks, Delaware and Montgomery counties didn’t get approved. 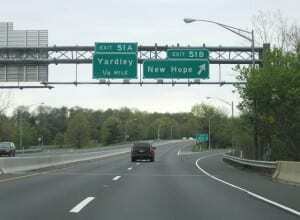 There is still more work to do before a route from Trenton to Philadelphia is completed. In December 2009, the New Jersey Department of Transportation adopted a Complete Streets policy, designed to ensure that roadways are designed with all potential users in mind. According to the National Complete Streets Coalition, such policies can offer many benefits in all communities, regardless of size or location. Complete streets make economic sense. A balanced transportation system that includes complete streets can bolster economic growth and stability by providing accessible and efficient connections between residences, schools, parks, public transportation, offices, and retail destinations. Complete streets improve safety by reducing crashes through safety improvements. One study found that designing for pedestrian travel by installing raised medians and redesigning intersections and sidewalks reduced pedestrian risk by 28%. Complete streets encourage more walking and bicycling. Public health experts are encouraging walking and bicycling as a response to the obesity epidemic, and complete streets can help. One study found that 43 percent of people with safe places to walk within 10 minutes of home met recommended activity levels, while just 27% of those without safe places to walk were active enough. Complete streets can help ease transportation woes. Streets that provide travel choices can give people the option to avoid traffic jams, and increase the overall capacity of the transportation network. Several smaller cities have adopted complete streets policies as one strategy to increase the overall capacity of their transportation network and reduce congestion. Complete streets help children. Streets that provide room for bicycling and walking help children get physical activity and gain independence. 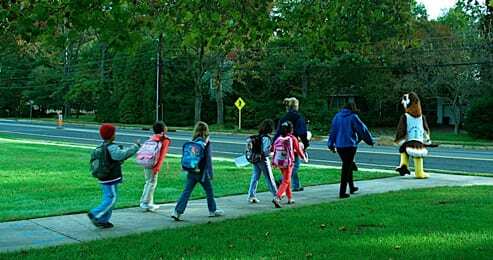 More children walk to school where there are sidewalks, and children who have and use safe walking and bicycling routes have a more positive view of their neighborhood. Safe Routes to School programs, gaining in popularity across the country, will benefit from complete streets policies that help turn all routes into safe routes. 1. Hear Andy Clarke, executive director of the League of American Bicyclists, explain why creating a bicycle-friendly community is a good economic-development strategy and boosts property values. 2. Brainstorm about ways the WWBPA can achieve its goals. 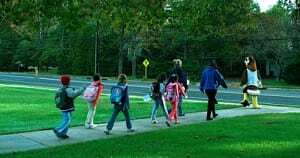 This year, we want to expand our popular “Walk to Hawk” on International Walk to School Day to other schools, highlight existing safe walking and bicycling routes and advocate for missing links. What do you want to see on the list? The WWBPA’s annual meeting begins at 7:30 pm on Thursday February 25 at the West Windsor Municipal Center, 271 Clarksville Road. We need your support, and your ideas! Together, we can make our vision of a safer community for bicyclists and and pedestrians — for you, your family, your friends and neighbors — a reality. I didn’t know Edward. I learned of his Tuesday death in East Windsor yesterday. Edward had Cerebral Palsy, CP. I don’t know the extent of his disability but he was riding a tricycle which is about halfway between a bicycle and a wheelchair. Cyclists probably relate to him as a fellow cyclist; I relate to him as a disabled person using a mobility device. Edward was riding his tricycle on Dutch Neck Road, a not especially busy suburban road, although there are some straight stretches where cars go quite fast. He was riding in the shoulder, or rather what was left of the shoulder after incomplete snow removal. He was struck from behind by a car and was thrown off his tricycle. He was taken to Robert Wood Johnson Hospital but was dead on arrival. The driver has since been charged with vehicular homicide; that’s little comfort to Edward. I have Multiple Sclerosis, MS, and use a power wheelchair. Although MS and CP are very different diseases, there are many similarities in their symptomatologies. As with several acquaintances of mine with CP, I try to live life to the full despite my disability. I go everywhere in my wheelchair in all weather, even in the snows we’ve been having in the last few weeks. I haven’t been able to drive for a few years now so the wheelchair is all I’ve got. Very often I have to use the road: often there’s no sidewalk, or the sidewalk is too badly damaged by broken paving slabs or tree roots, or it’s impassable because residents haven’t cleared brush, or, as now, residents haven’t cleared snow or snow plows have used curb ramps as convenient dumping places for snow, or, also as now, I have decubitus ulcers and the jarring and bumping from even a passable sidewalk is too painful. If there’s a shoulder or bike lane I’ll use it. I have a fast wheelchair: not as fast as an average cyclist but faster than a slow cyclist or average runner, so if there’s no shoulder nor usable sidewalk I’ll use the road. I’m sure this sort of calculation was familiar to Edward. Tomorrow I have to go to the Kessler Institute in West Orange for Occupational and Physical Therapy. I made my transportation arrangements on Tuesday. I have to take the train to Newark and then made a reservation with NJ Transit’s disability service, Access Link, to take me from Newark to West Orange. I don’t particularly like Access Link: apart from having to make arrangements at least 24 hours in advance, the pickup time is only within a 40 minute window, the driving time is very unpredictable (it could be 20 minutes or if there are other pickups as much as one and a half hours), and it is unusual to get exactly the times one needs. For this trip, either it was too early (I have a home assistant who comes at 6 a.m. to wash and dress me: I’m not ready until 7:30 a.m.) or it was too late and I’d miss half the appointment. I had no choice but to take the later time. I don’t know whether Edward used Access Link, but even if he did, I’m sure he preferred to cycle whenever possible, just as I prefer to use my wheelchair whenever possible. There is a bus from Newark to West Orange that I’ve sometimes used when I couldn’t get a convenient Access Link pickup. However, the last half mile is on a busy four lane county road. When I was there on Monday, the shoulder was full of snow. I was about to cancel my Access Link reservation and take the bus instead. Then I thought of Edward. Dutch Neck Road is a much quieter road. I called Kessler to say I’d be late for my appointment. I’d keep my Access Link reservation but get there alive. Edward, I’m sorry I never knew you. I think we’d have both enjoyed sharing fish stories over a beer. Read the previous post Cycling Tragedy in East Windsor. The WWBPA is saddened by the tragic death of a cyclist killed by an overtaking vehicle on Dutch Neck Road in East Windsor on February 16. According to local newspaper accounts, the East Windsor man, Edward Boye, relied on his bicycle to get around because he suffered from cerebral palsy. The driver, Margaret Corrigan, also of East Windsor, is reportedly facing vehicular homicide charges, among others. This is the second serious accident on Dutch Neck Road this month involving a cyclist or pedestrian. Earlier this month, a cast member of ‘Sesame Street’ who lives in the area was hospitalized after being hit by a car while crossing Route 130 at Dutch Neck Road. Please drive safely within the speed limit and give bicyclists plenty of room when passing – half a lane is a good rule of thumb. Under New Jersey law, bicyclists have the right to ride in the travel lane. Motorists, please share the road with bicyclists, pedestrians and other vulnerable users of the roadway, such as the disabled, crossing guards, police officers and maintenance workers. Please join us in extending our condolences to the families of everyone involved in this collision. Bike New York’s TD Bank Five Boro Bike Tour, on May 2 this year, is 30,000 riders enjoying a car-free, 42-mile ride through New York City. It hits all five boroughs and takes bicyclists on roads they usually can’t ride, including across the Verrazano Bridge. Registration has begun. The spots fill up quickly; last year, the ride sold out two months in advance. Bike New York organizes several other one-day rides in the region over the summer. Rails-to-Trails Conservancy’s annual Greenway Sojourn this year will meander across 250 miles in southeastern Pennsylvania and along the Delaware River valley from July 17 to 24. It includes overnight stays on the Battleship New Jersey on the Camden/Philadelphia waterfront and on Bulls Island on the Delaware. Looking to ride and raise money for a cause? One local ride is the Tour de Cure, which supports the American Diabetes Association, on June 6. Routes range from 10 to 62.3 miles. You’d rather plan your own ride? Head out on the East Coast Greenway or New Jersey DOT’s High Point to Cape May route. Both skirt West Windsor. The state also has developed a number of shorter loops around the state. And don’t forget West Windsor’s own BikeFest, this year on May 29. It’s a great family event, with many different rides for different kinds of riders, and the WWBPA will be there. What organized rides and tours would you recommend? Tell us about some in which you’ve participated. You don’t need to open up your wallet very far to get an effective bicycle helmet. The Bicycle Helmet Safety Institute hired a firm to run tests on six helmets. Three sold for under $20, and three sold for more than $150. The conclusion? The impact test results were virtually identical. The extra bucks may get you an easier fit, more vents and snazzier graphics, but not more safety. Regardless of how much you spend, your helmet needs to fit properly to protect your brain. As the BHSI asys, you want the helmet to be comfortably touching the head all the way around, level and stable enough to resist even violent shakes or hard blows and stay in place. It should be as low on the head as possible to maximize side coverage, and held level on the head with the strap comfortably snug. And remember–always wear a bicycle helmet when biking, not a helmet for skateboarding or some other sport. 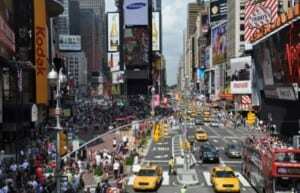 After an eight-month trial, New York City officials said those new public spaces around Times Square and Herald Square (and the sections of Broadway closed to motorized traffic) will become permanent. They noted that accidents have decreased and overall traffic speeds have increased (though not as much as city officials had hoped, the New York Times noted). Of course, these plazas also have been wildly popular, particularly during good weather, and the changes are generally backed by area businesses. Mercer County and the Delaware Valley Regional Planning Commission are asking cyclists for their input on “bikeability” of roads in the county, using this map. Bikeability is an estimate of how comfortable it is to bike along a roadway, and includes many factors, including traffic volumes, traffic speeds, pavement widths, and whether there is a usable shoulder. 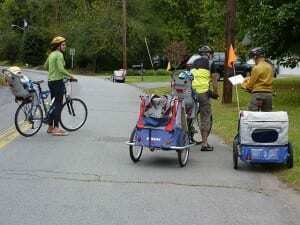 The West Windsor Bicycle and Pedestrian Alliance, which has assessed West Windsor roads for its own map of the Township, is participating in this project. Here’s one early reaction. The outcome will help bicyclists plan bicycle-friendly routes to ride and help planners identify priority bicycle corridors and facilities to be considered in the future. Proposed routes and comments will be accepted until Friday, March 12. Walking and Biking in the Meadowlands? Getting across the Meadowlands has been one of the biggest challenges for the East Coast Greenway, the 3,000-mile route that will stretch from Maine to Florida and uses the D&R Canal on the edge of West Windsor. Now there’s a possible opening. New Jersey Transit is building two new rail bridges across the Hackensack River and taking 2.5 acres of parkland from Hudson County to build a new rail facility. State law mandates that it must compensate Hudson County by providing double the acreage being taken or double the dollar value of the taken land, or a mix of the two. The ECG wants that mitigation to take the form of two miles of trail in Hudson County, including a bike & pedestrian path on the new southern Hackensack River bridge, to bring the Greenway off-road from Belleville Turnpike in Kearny to West Side Avenue in Jersey City. Two miles of trail, in a 20-foot wide corridor, comes to five acres. Letters will be accepted until Feb 24. Also send a copy to the East Coast Greenway, 27b North Rd, Wakefield RI 02879 or email it to info@greenway.org. Comments Off on Walking and Biking in the Meadowlands? West Windsor Bicycle and Pedestrian Alliance trustee Michael Ogg and member Catherine Zandonella defended the rights of pedestrians in the West Windsor-Plainsboro News after a letter-writer suggested that pedestrians shouldn’t expect cars to yield, even when they are in a crosswalk, and blamed “defiant” pedestrians for darting into streets. 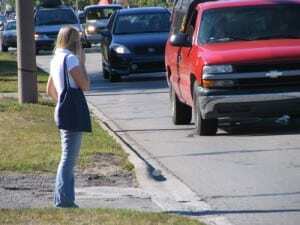 It’s time for everyone to show courtesy and let everyone use and cross roads safely. 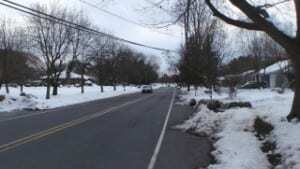 We don’t need an incident even more severe than the one at the intersection of Princeton-Hightstown Road/Route 571 and Wallace Road in November. Pedestrians are out there and, as Catherine noted, are not going to go away. The new I-95 bridge, which would be widened to 13 lanes including shoulders from the current four, is scheduled to be built within the next few years. The ability for bicyclists and pedestrians to cross the Delaware River between Pennsylvania and New Jersey is severely limited. More than half of the bridges crossing the river do not allow bike/ped access. This bridge would connect two major linear trails (the Delaware Canal and the D & R Canal), encourage bicycle tourists to explore beyond Washington Crossing south to Yardley, Morrisville and West Trenton, and bring the bridge into compliance with Federal Highway Administration guidance for non-motorized transportation access, including providing people with disabilities their first crossing of the Delaware. The pathway would cost about $14 million, or 7% of the total project, and is supported by communities on both sides of the river. More than 1,500 people have already signed the petition. For more on this, read here. A new report from the Alliance for Biking & Walking shows that lack of investment in biking and walking could be contributing to higher traffic fatalities in the U.S. In New Jersey, 12% of all trips are on foot or by bike, according to the study, putting us on par with California, Pennsylvania and Connecticut and not far behind New York. Yet 23% of all traffic fatalities were pedestrians or bicyclists. Only New York (25%) and Hawaii (24%) fare worse. And only 0.6% of its federal transportation funds go to benefit bicyclists and pedestrians, one of the lowest ratios in the nation. Walking and bicycling also are great forms of exercise and a way to help fight the country’s growing obesity problem–if we can make it safe. In West Windsor, the WWBPA is advocating for a safer Princeton-Hightstown Road/Route 571, which has 50% more accidents than similar roads in New Jersey. We also want safer routes to the Princeton Junction train station and more safe routes to schools. We have held a number of events to highlight safety problems across down and conducted an inventory of 193 intersections to assess walkability. Led by Gail Everett (owner of Olivia’s Wellness Connection), the walk will start at the plaza in front of the Paul Robeson Center at Paul Robeson Place and Witherspoon Street in Princeton, proceed up Witherspoon Street to Nassau Street, from Nassau to Harrison Street, then up Harrison to Valley Road, and then finish the square by walking back up Witherspoon Street to the Paul Robeson Center. By wearing red, you will join the American Heart Association in expanding awareness about heart disease, the No. 1 killer of women.